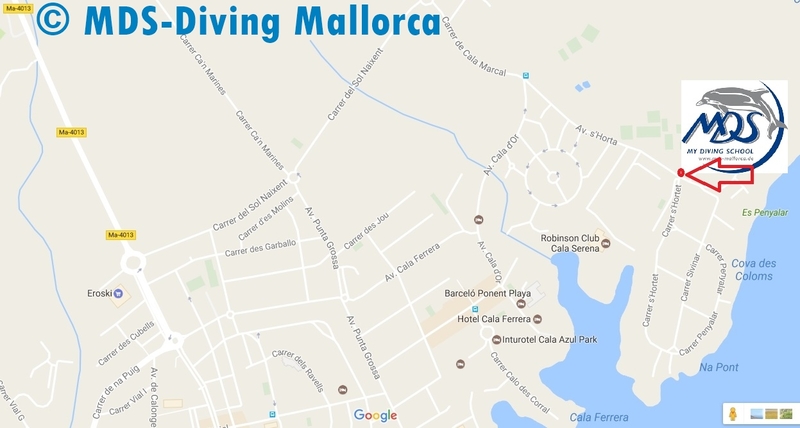 You will find our dive center at the southeast coast of Majorca, in Cala d’Or in the Cala Serena, approx. 55 km (34 miles) from the capital Palma de Majorca. 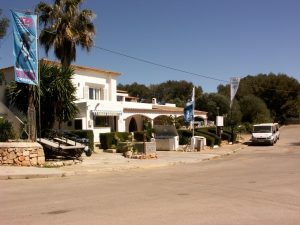 The dive base is situated above the Cala Serena, approx. 150 meters (500 feet) from the sandy beach of the bay. The well-known Robinson Club Cala Serena is only a few feet away. Directly next to the dive center there is a restaurant with snacks, menus, good coffee and cake etc. This is also the place where divers meet before and after diving for a chat. We work hard and like to bring an unforgettable experience home. With us you can be sure that we always come up with something new to inspire you over the years with interesting additions. In 1996 our diving school was reconstructed for diving operations according to modern aspects for the first time and has an inner surface of approx. 150 m2. Further reconstructions followed in 2010, 2012, and 2015. These resulted in a new, large rinsing pool, reconstruction and renovation of the changing area and sanitary facilities with an additional toilet, and a complete reconstruction of the equipment hand-out and staff area. 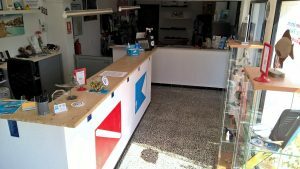 Also the office, our small shop and the equipment hand-out area were adjusted according to customer wishes in 2015. Our diving center is divided into reception (office) with a small shop, seminar and training room, equipment hand-out area, workshop, wet area, changing area (of course with sufficient storage space for private gear), sanitary facilities, compressor station and staff area. We have a large, professionally equipped training room (video/DVD, flipchart, whiteboard, beamer). 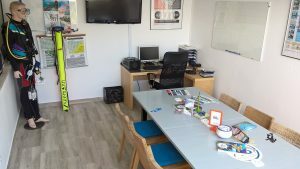 This room is not only used for the theoretical part of the scuba diving training, but also for seminars and presentations (e.g. flora and fauna of the Mediterranean). We want to offer our guests as much comfort as possible. Cleanliness and hygiene, especially in the sanitary facilities is a given for us. Air dryers in the wet areas of our diving base ensure a dry climate even during high season. We also offer a separate (and locked) room for equipment that doesn’t like humidity, such as lamps, cameras and their housing, where they can be stored and also charged. Of course our rental equipment leaves nothing to be desired. Suits in all sizes and thicknesses enable you to feel free and relaxed under water. Our rental BCDs have integrated weight pockets. For “heavyweights” we also offer harness weight belts. Underwater lamps and cameras for your diving trips are also available for rent. Our Scubapro regulators are serviced several times a year. Of course all regulators are equipped with an alternate air source (octopus) and also a pressure gauge or diving computer with depth gauge.